It was a cold November day. For some unknown reason I was awake early in the morning. Little did I know what the day had in store for me. I was making my daily visit to facebook when I discovered something unusual. 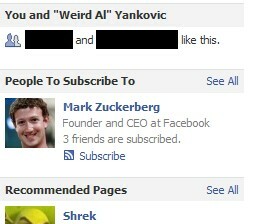 I noticed 3 of my friends were subscribed to Mark Zuckerberg's facebook page. I thought to myself; "who are these people? and why are they on my facebook friends list?" Eventually I started to see Mr. Zuckerberg everywhere I went on facebook. I couldn't escape him. Whenever I read a post made by a friend, Mark Zuckerberg was there. Whenever I visited a facebook page, again I would encounter the smiling face of Mark Zuckerberg. 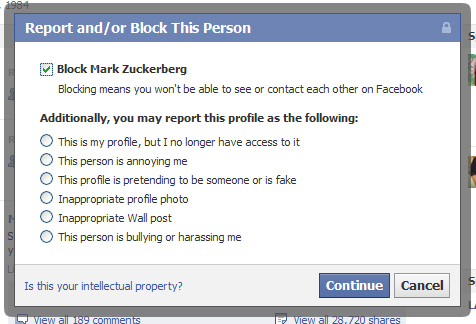 Finally I decided to pay a visit to Mr. Zuckerberg's facebook page. While I was on his page I had a crazy idea. I wondered if I could block the account of the very man who runs facebook? Now my motivation here was purely one of curiosity. I just wanted to know if it could be done. Forget that, I had to know. As for Mark Zuckerberg himself, well it was nothing personal. I actually like the guy, I really admire his 'chutzpah,' especially his vow to eat only animals he kills himself for an entire year. Although I'm far from being a hunter, I can relate to that sort of crazy thinking. And I'm sure a man like him can see the obvious humor in my little quest. And well, although I have a facebook account, I have probably blocked more people than I actually have on my friends list. One more wasn't going to hurt. On my first attempt to block Mark Zuckerberg I received an error message telling me the system was overloaded. I waited a few hours and I tried again. On my second attempt I received the same error message. I tried several times and still nothing. That's when I decided to ask my friends for help. When they tried to block his account they all reported the same error message. We waited a few days and tried again. Still unblockable. Finally I created a new account, with a new name, and guess what? I still couldn't block Mark Zuckerberg! I even asked my Mom to try. No avail. 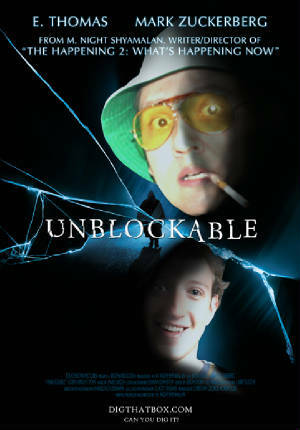 Mark Zuckerberg's facebook account is unblockable!